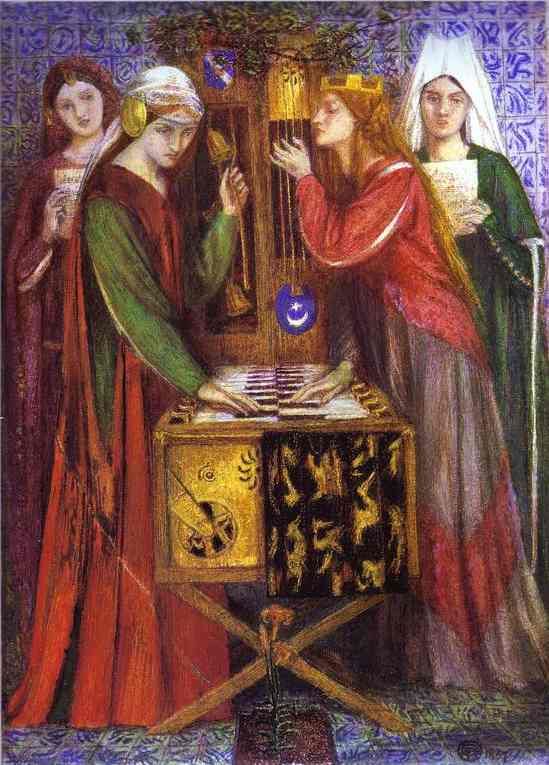 In Morris’s early poem ‘The Blue Closet’ Lady Alice informs us that ‘They give us leave,/Once every year on Christmas-eve,/To sing in the Closet Blue one song’, so those four enigmatic women - two queens and two damozels - are presumably at their eerie song even as I write. The motif of female imprisonment in a tower comes to Morris from Tennyson, from ‘The Lady of Shalott’ above all, though that motif is part of a broader cluster of poems concerned with imprisonment and breakout in Tennyson (‘Mariana’, ‘Kraken’, ‘Palace of Art’, ‘Ulysses’). A quick structural analysis reveals the deep ambivalences at work here: imprisonment is stifling (obviously) but also protective (external dangers cannot get at you), while break-out is the jubilant emergence of an authentic self (obviously) but also, more unexpectedly, lethal, as for the Lady of Shalott, the Kraken and Ulysses. I’ve sometimes felt that for every poet you could knock up a little analytic machine comprising a founding binary opposition with profound ambivalences on either side of it which would, at the level of deep structure, generate poem after poem on the surface. I try to show how this works around issues of higher versus lower reality in my undergraduate lecture on W.B. Yeats, for example. So could Morris’s early poetry, so close anyway to Tennyson’s in thematic content, be subject to a similar analysis? To some extent, yes: his ‘Golden Wings’ works exactly like ‘The Lady of Shalott’ or ‘The Kraken’ (you break out but die in the process). Yet what is novel about Morris’s treatment of these issues is that there is typically not one but two imprisoned consciousnesses (one male, one female, as in ‘Spell-Bound’ or even ‘The Blue Closet’ itself), which strain longingly towards each other across an impossible distance: ‘Yet now I wait, and you wait too,/For what perchance may never come’.